This client wanted to create a stunning decking and patio area in their garden, used for entertaining and relaxing in the summer, with trees to give the impression of height. We of course accepted the challenge! This client’s garden is a pretty blank canvas, with no standout features. 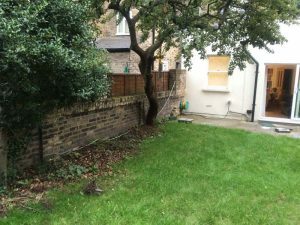 Although there are some trees that will remain in the garden design, the client would like a complete overhaul, creating interest and transforming the space into a relaxing haven. As well as creating a decked space in the garden, the client wanted us to create a crisp, clean space. The focus of this design is on creating a crisp clean space, with room for entertaining and enjoying the garden throughout the year. Directly outside the patio doors there will be a section of linear silver-grey granite plank paving spanning the width of the garden. The paving adjoins hardwood decking, which will also span the width of the garden and continue vertically up a new 4m long x 2m high section of concrete block wall constructed along the left boundary. The decking in the garden will also feature a decked bench laid with the same board direction, to create a single continuous flow. A matching pattern of decking/bench/wall cladding will feature the other side of a central table. The table area itself will also follow the same pattern using black granite as the motif – black granite paving on the floor, blending in to a black granite table with a black granite panel to the side wall. 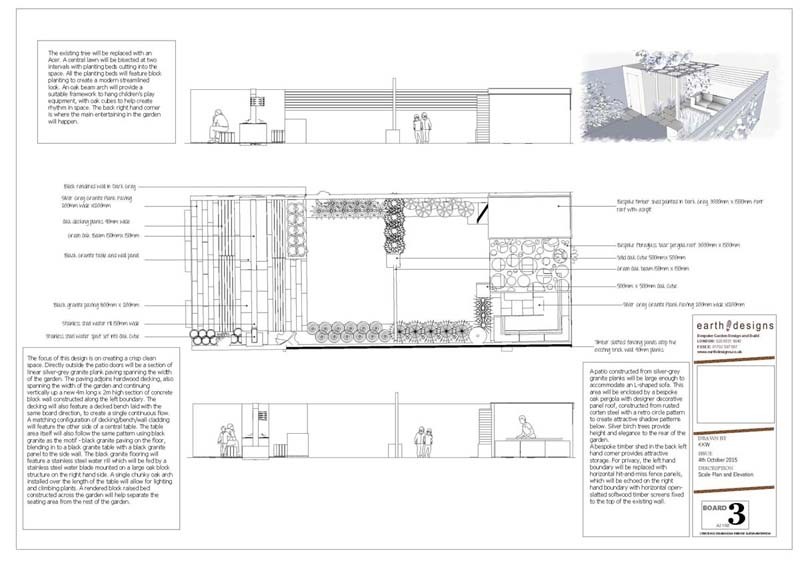 The black granite flooring will feature a stainless steel water rill, which will be fed by a stainless steel water blade mounted on a large oak block structure on the right hand side. A single chunky oak arch installed over the length of the table will allow for lighting and climbing plants. A rendered block raised bed constructed across the garden will help separate the seating area from the rest of the garden. The existing tree will be replaced with an Acer. 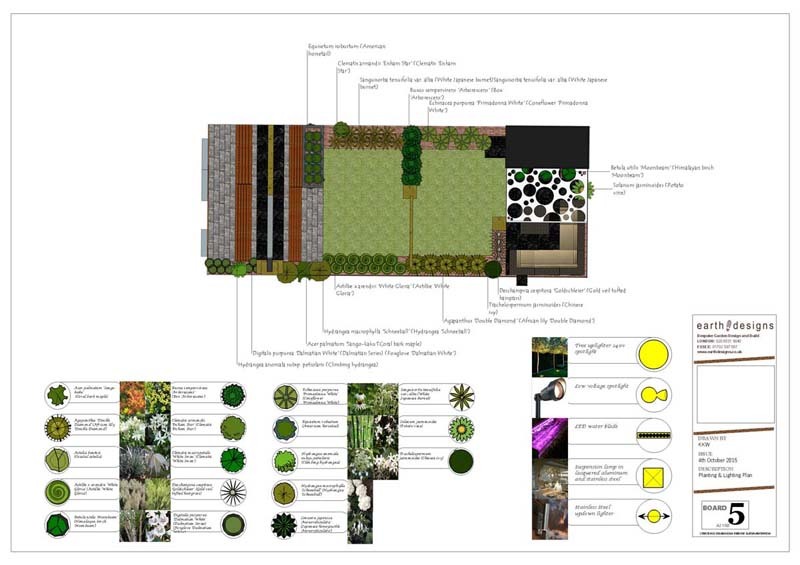 A central lawn will be separated into two intervals, with planting beds cutting into the space. 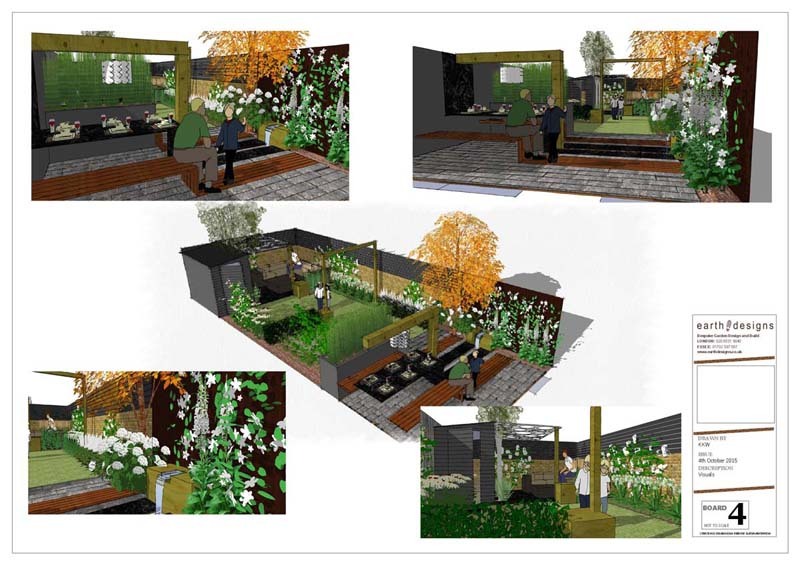 All the planting beds will feature block planting to create a modern streamlined look in the decking in garden and the rest of the space. An oak beam arch will provide a suitable framework to hang children’s play equipment, with oak cubes to help create rhythm in space. The back right hand corner is where the main entertaining in the garden will happen. A patio constructed from silver-grey granite planks will be large enough to accommodate an L-shaped sofa. This area will be enclosed by a bespoke oak pergola with designer decorative panel roof, constructed from rusted corten steel with a retro circle pattern to create attractive shadow patterns below. Silver birch trees provide height and elegance to the rear of the garden. A bespoke timber shed in the back left hand corner provides attractive storage. 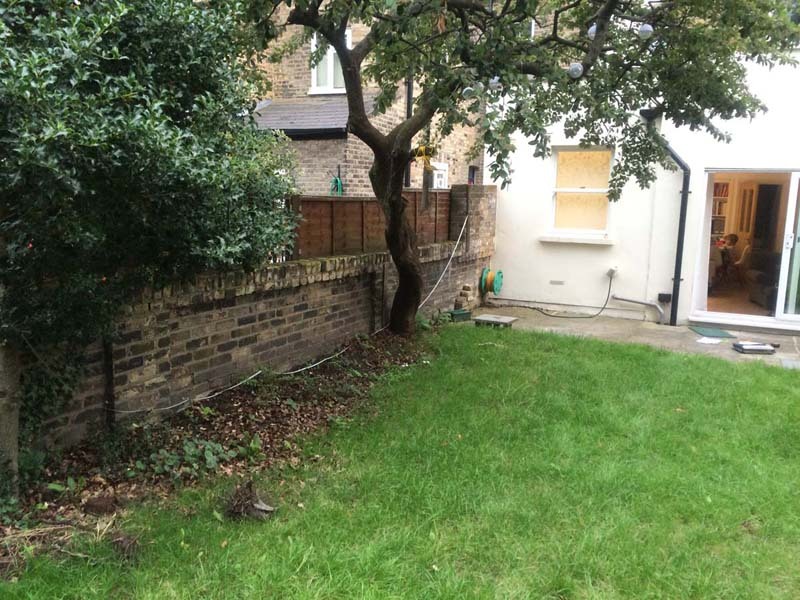 For privacy, the left hand boundary will be replaced with horizontal hit-and-miss fence panels, which will be echoed on the right hand boundary with horizontal open-slatted softwood timber screens fixed to the top of the existing wall. This garden design combines rustic hardwood decking and oak beams, with granite and stainless steel to offer a great balance in textures and colours. 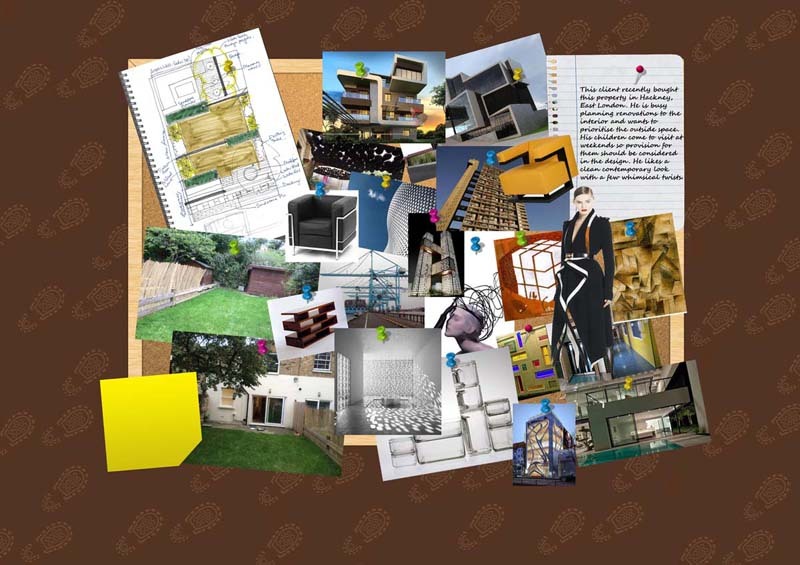 The combination of these natural materials offers an organic feel and the perfect balance for a garden of this scale. With the dark granite, hardwood and oak beams, this garden design needs some lightening with greenery and the planting plan. Therefore, we have added lots of light with white flowers and pale greens, with the large lawn area offering more contrast. The planting plan in this decked garden includes Asian-inspired plants such as Chinese ivy, Japanese honeysuckle, Agapanthus and an Acer to replace the existing tree that currently dominates the garden. These will be offset with some lighter elements such as Astilbe White Gloria and White Japanese Burnett to offer softness. 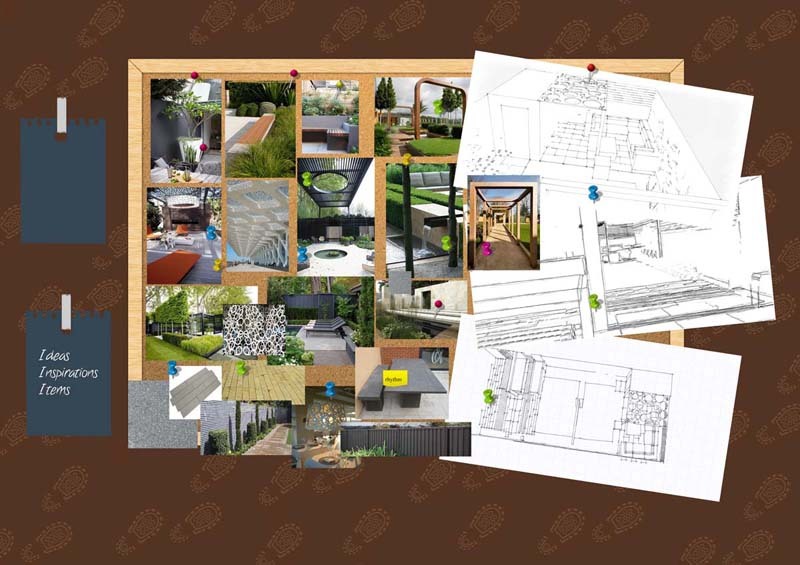 To hear about the latest London and Essex garden designs and garden inspiration from Earth Designs, make sure you follow us on Instagram, Facebook and Pinterest.